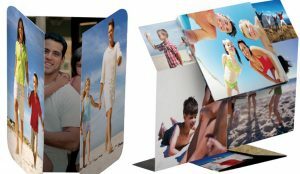 Provide an endless loop of fun (or hard-hitting marketing messages) with FunFlips – a little card with huge impact! Imagine creating unique promo cards that unfold — like a piece of origami — to display four completely different images or messages. Same Day Printing’s FunFlip cards allow you to to do just that. From a simple 3” x 3” square, the card unfolds to display four different images. The unique Flip and Fold motion of your promo card will have recipients interacting with your card again and again.